Reports of Cabinet decision confirmed as IDF Chief of Staff notes 'growing concern' for teens, affirms assumption is they're alive. 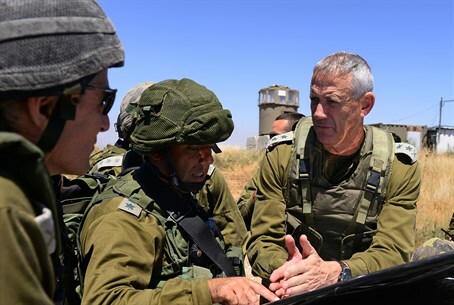 IDF Chief of Staff Benny Gantz visited Hevron to oversee the search efforts of Operation Brother's Keeper on Tuesday, before holding a briefing for journalists about the efforts to locate the three teenagers kidnapped roughly twelve days ago. "As time passes the concerns grow, but from our perspective the working assumption is that they're alive," remarked Gantz. IDF forces, in cooperation with Israel Security Agency (ISA or Shin Bet) and police forces, will continue the operation with its goal of rescuing the teenagers and attacking the Hamas terrorist infrastructure in Judea and Samaria, added Gantz. Gantz's statements come even as the Security Cabinet on Tuesday decided to scale down the IDF operations against Hamas and focus on locating the teens, concentrating on arrests that would aid in gathering intel about the three. The Cabinet decision was initially denied by Defense Minister Moshe Ya'alon, who said Tuesday "there are no orders to reduce the level of activities in Judea and Samaria." The operation has so far seen the arrest of 369 Hamas terrorists, 57 of them being re-captured after having been released in the 2011 Gilad Shalit deal that freed 1,027 terrorists. 65 Hamas institutions in Judea and Samaria have been closed, and over 1,800 houses have been searched. According to reports four Arab rioters have been killed during the operation, which has seen frequent violence targeting the soldiers. A senior IDF officer said Tuesday "the central effort is the search effort, and we're acting to achieve that. We will refresh the forces and replace a portion of the headquarters to let the forces reorganize." "We will start to see from this weekend the fruits of the operation when those released in the Shalit deal will be stood before the committee and understand that they are going back to jail for dozens more years," anticipated the captain. "Hamas didn't think this is how things would be, and that definitely will change the picture." Attorney General Yehuda Weinstein on Tuesday submitted a request to cancel the re-release of ten of the Shalit deal terrorists who were recaptured. It is not clear why the terrorists are currently being reconsidered for release again, having been rearrested for breaking the terms of their release.